To rekindle the ability to act together that defeated Apartheid and with it transform and strengthen our democracy. To create solutions that enable communities and individuals to act together with more endurance, skill and independence from above than is feasible today. To bring to life the Freedom Charter's first and principle demand, that the people shall govern, and to create a beacon for our continent as it enters its century. * In pursuit of this mission, Grassroot is a non-profit, certified as a tax-exempt, public benefit organization under South African law. Founder and CEO of Bluefields; former Executive Director of Economic Development at the City of Johannesburg; executive at the Development Bank of South Africa; and coordinator of the South African Cabinet Committee on the Economy. Independent Non-Executive Director at Grassroot and Chair of the Board. Former Commissioner of the Companies and Intellectual Property Commission (CIPC); Deputy Director-General of the dti; served on the Financial Services Policy Board; National Lotteries Board, among others; over 20 years' experience in public policy, regulation and governance. Independent Non-Executive Director. PhD student at UCT. She was Grassroot's first community builder from 2016-17, in which role she engaged extensively with early adopters and helped build Grassroot's field organization. Formerly at McKinsey in Johannesburg and Shanghai for 5 years (2005-10), the World Bank in New Delhi for 3 years (2011-14), and advisor to municipal and national government in South Africa (2014-15). Executive Director at Grassroot. .
General Manager. Former Volunteer Development Manager and Consultant at AFS-RSA (American Field Services), with a background in community based projects. Responsible for overseeing the Ambassador Program; the program with direct outreach and fieldwork in marginal communities. Community builder, coordinating field work in KwaZulu-Natal, assionate about working with the marginalised and helping them change their lives. She holds a degree in Community & Development Studies. Previously worked at various NGO's and Local Governance working with communities. Community builder, coordinating field work in the Greater Johannesburg area, managing Grassroot social media and LiveWire. Self taught digital marketer, graphic designer and social activist. Former Gauteng working group member within the Right 2 Know campaign. Junior developer, working on core platform maintenance, Angular frontend, and Android client. Junior developer, building the Grassroot natural language understanding (NLU) service and Android client. Operational team member, supporting fieldwork in Greater Soweto, content production and awareness building for for LiveWire. Previously studied fashion design, and worked with a range of civil society organizations (including amandla.mobi). 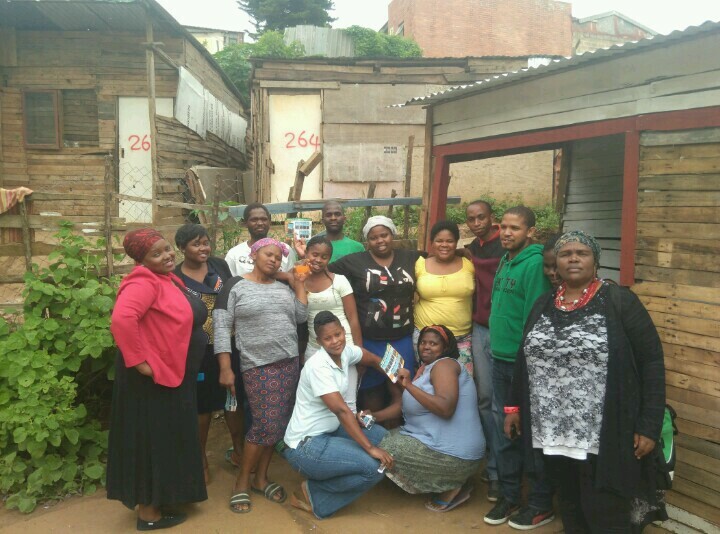 Every Saturday morning, residents of Mzondi informal settlement get Grassroot notifications reminding them of their weekly meeting. The agenda of such meetings is usually development. It is decided here into how many groups they will be split into and what will be the task of each individual group. In and through these groups they have built informal housing, dug their own water, and built sanitation. Recently they conducted a fundraising campaign, raising over R70k to install their own sanitation, for a community of thousands of people. They're now increasing their pace of self-organizing through Grassroot, to use the funds well and continue building their community. We have partnered with amandla.mobi, on the #DataMustFall to lower mobile data costs. They recruited volunteers to head out into the streets and collect signatures of people in support to the campaign, which were then uploaded using the Grassroot app to a master list. That enabled the campaign to broaden its reach and include people that otherwise wouldn’t be reached by online methods. That added thousands of extra people to the campaign, who were then repeatedly mobilized through broadcasts and notifications during key campaigns. In Tshepisong, “a meeting is not a meeting if it’s not called through Grassroot”. The community there has organized itself all the way down into various block committees, and as a whole has over a thousand people on is Grassroot group. It recently used its organizational strength to engage a local school that had classes built for preschool but had never opened them. The classes will open for children in January. The community of Thembelihle has been conducting a "social audit" to find out the challenges facing the community, specifically on corruption and service delivery. It is said that a local contractor has been given an extended period with a budget of 12 million rand for six months that was granted in January. Yet people still get inadequate sanitation services. The goal is to compare the specifications on the tender document and to do physical verification to find out whether the specifications are as explained on the tender specification and must match with what the community sees. The audit has been led by PlanAct, who have in turn relied on Grassroot to get the message out -- as their ground organizer put it, "with Grassroot half the battle is won".